To preserve your arbour or planter at its beautiful best we recommend you Paint/stain it at regular intervals. We can offer you the identical paint/stain used in the manufacture. 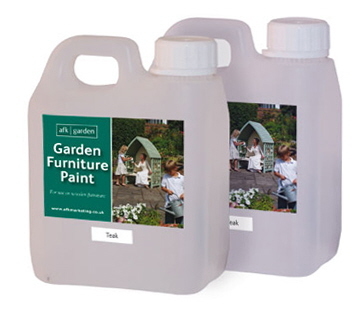 This superb range of paint/stain supplied in 1 litre tubs is easy to apply and brushes can be washed out in warm water. Manufactured from heavy duty galvanised steel the anchoring kit ensures total stability in windy or stormy weather. Also with garden thefts on the increase, it means your garden furniture is more likely to Remain where you put it. 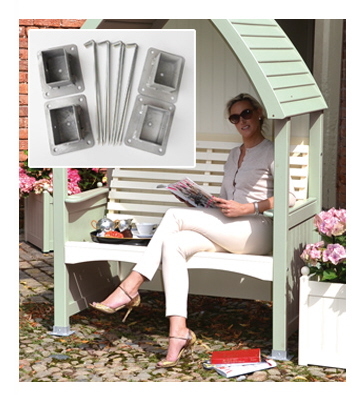 The substantial base plate can be secured to lawns with the 250mm (10”) long pegs supplied or can be bolted to any concrete, brick or wood surface using appropriate fixers. To order send a cheque or PO made payable to AFK Marketing Ltd and post to AFK Marketing: 1 Lincoln Road, Leasingham, Sleaford, Lincs. NG34 8JS. If you prefer to pay by credit/debit card please ring 01529 304926.